I was talking with a beautiful friend the other day about ghosts from the past. I have a few, as does she. Some of hers are just louder than mine. She had been in conversation with a family member just hours before who had used the term “damaged goods” when referring to her. As she spoke the words through tears, I felt rage welling up in my spirit and showing itself all over my face. At this point in the conversation I had a couple of options. I could begin ranting about what a ridiculous self-assessment this girl was making or I could speak the truth in love. Please keep in mind that it infuriates me when someone allows another human being, mortal, flesh and blood, to strip them of their identity in Christ. What shakes me to my core is when that individual doing the stripping is a mother or other guardian who has been entrusted with shaping the life of someone else. Thankfully I chose the latter of the two options. I had to come clean. “You know, it’s a difficult concept to fathom. At times I have trouble grasping it myself. But I know it’s true, because Jesus said it and He doesn’t lie.” We both agreed that neither of us could refute Jesus’ words. As we left each others company that afternoon the wheels were turning in my mind. God is always on time, yes? This morning, Rodney Anderson spoke at Buckhead church. He took a passage from Luke 18 and explained it in such a comprehensive and applicable way. He was talking about this very thing! Comparing and thinking better of oneself and praying as if God takes out His list to make sure we are worthy of being listened to. It doesn’t happen that way. It’s an awesome message that you can watch by clicking here. Be encouraged. No matter the size of devastation along the trail you have blazed, Jesus is enough. He paid it all. Your ransom, my ransom has been PAID IN FULL. This entry was posted in Life and Death, The Monster Within, Wisdom and Truth and tagged Body Image, Buckhead Church, Christ, Darkness, Eating Disorders, Experience, Faith, flesh and blood, Girlfriends, God, Happily Ever After, Jesus, New Life, postaday, Rodney Anderson, Sacrifice, The Truth Hurts by Joy. Bookmark the permalink. Hi Joy, I just found your blog and have thoroughly enjoyed my wanderings through your posts. What a beautiful way you have with words, I love your honesty and refreshing realness. I look forward to coming back often. The internet needs more REAL believers like you. Thank you so much for stopping by. I appreciate your feedback and encouragement. I smile as I look upon our bulletin from today’s sermon where the scripture is listed as Luke 18:9 – 14; and I remind myself that I believe there are no consequences. God’s got it all in hand. If we are damaged and scarred and I would probably agree we are but I think we all are even those who appear to be orphan saving, bible school attending, tither’s X 3, never kissed, and beyond reproach. Some of us have scars that show and some have hidden scars but all have scars I believe. Scarred and damaged but also healed and restored by the master and his child now and forever. Standing in wonder under his wings. I love how passionate you are about your friends and how protective. I am much the same way. I think that is love manifested! I was thinking Joy that God does not even see the scars….. I don’t know? I think He does, only very differently than we see them. Joy, I feel so connected to your words. I too have seen myself as damaged goods. Damaged by actions of others as a child and damaged by choices I made as an adult. This paragraph touched me.. Thanks for saying and writing what I so often think in silence. You are an amazing woman who has weathered the storms and is now sharing your experience, strength and hope to help others. You are so beautiful and so very cherished by those who have the privilege of knowing you. You have a kind and generous heart filled with love and faith. Just a beautiful post filled with inspiration. 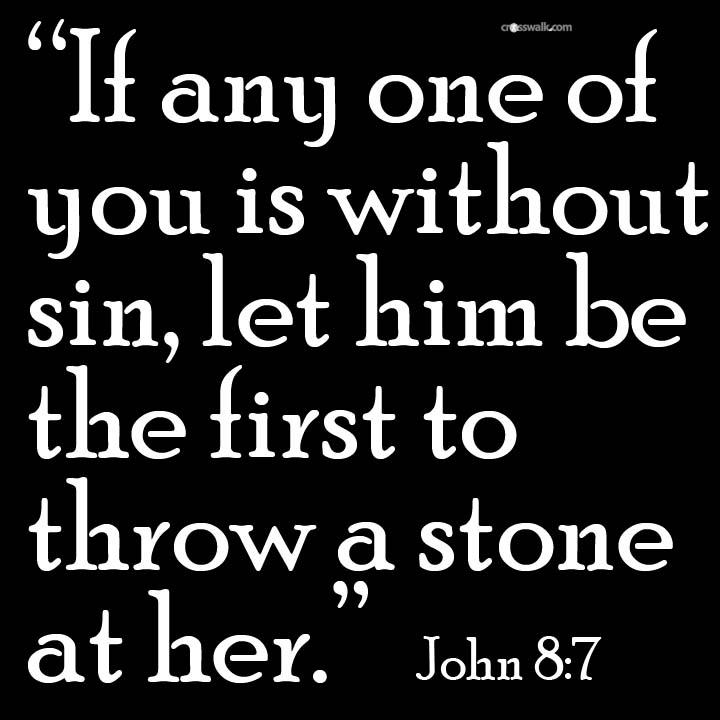 Yes, nobody should judge someone unless they are “sin free,” and we all know everyone has sins , that nobody is perfect. We have our flaws. We all need to be saved. You are a great friend who gave a very invaluable advice! Thank you so much for your sincere response. I appreciate the encouragement more than you know. You are a gifted writer. I know God brought me to your blog to stir up my complacent thoughts and make me restless. Thank you so much for reading and taking the time to comment. We all find ourselves in a place of complacency from time to time in our faith, in our life, in our work…for me it definitely shows up as restlessness. It used to frighten me. Now I look at it with great expectancy, knowing that God is about to show up in a big way. Blessings to you, my friend, as you embark on this new week filled with endless possibilities.